Sing hallelujah to the Lord! Praise the Lord, for His mercies endure forever and His love and care are far beyond our imaginations. Tonight, for the ninth evening, we gathered again around our young brother Bomani* to pray for his deliverance. Bomani is one of our students and about two weeks ago he started manifesting strange behavior. While a little company composed of two pastors, his mother, and the wife of one of the pastors prayed for him, he spoke of a demon that was coming in and out of him. Then there was a strange smell. He could see the demon, but no one else. He was acting strangely. He stopped eating, he stopped talking, and could not stand being touched. We gathered every night and every morning to pray for him. In my mind I could not understand; surely the Lord wanted to deliver this young man! So why, when we prayed and sang, nothing happened? We prayed with authority that the demon would leave, but nothing happened. Singing hallelujah to the Lord! I reviewed the deliverance stories in the Bible. In each one, after the command of Jesus or Paul, the demon had left. Why not with us? It was implied that perhaps someone among our prayer group did not have their heart right with the Lord. We individually searched our hearts to make sure there was nothing between us and the Savior. But we continued praying. Bomani seemed to react most to certain songs like: “There is power, power, wonder working power in the blood of the Lamb.” It looked like he was trying to sing. But the next day, everything was the same, if not worse. He made uncontrollable mimicries of hatred on his face; sometimes he would make strange sounds from his mouth. He refused to touch the Bible, pray, or sing—but that was to be expected in someone possessed by a demon. Bomani became thinner and thinner, weaker and weaker, day by day. One day, my heart broke as I saw him trying to go up the three steps into the classroom. He could barely lift his leg. I asked him whether he wanted to be delivered and he answered: “I do not have any problem. I am ok.” I tried to explain that a demon had taken possession of him and was trying to prevent him from living the life and purpose that Jesus Christ had for him. Then he told me: “Go, just go.” Of course I knew that it was not him speaking. That same day, he came and sat in my class as I was teaching last day events. The class was on the end-time working of the devil. As I wrote the words “spiritism” and “evil” on the board, he looked with widely opened eyes and started pounding on the table. I erased these words and wrote JESUS CHRIST instead. He looked at it from time to time, but he ended up laying his head on the table and fell asleep. Elisha and Nadege Vande Voort. Another night, after a long session of praying and singing, he asked for a piece of paper and a pen. He wrote “devil” then “you” then crossed the whole thing out. And again the same thing. He had still not uttered one single word. We could not figure out what he was trying to say. We asked the Lord for wisdom. Day after day we prayed and sang—together and individually. Last Sabbath, the sermon was about Mathew 7:7. It was very encouraging. As the person preaching was saying the closing prayer, an assurance entered my heart: the Lord was going to answer our prayers. Another teacher told me the same thing: “the Lord gave me the assurance that He was going to answer our prayers.” But that evening, as we gathered to pray again, nothing happened. In my heart, I was asking the Lord for a special supply of faith. I was fighting with myself, asking the Lord to reject any little doubt. The next day’s devotion from Revival and Reformation was on Mathew 7:7. For me it was clear that the Lord was trying to encourage us. I shared that with the students, encouraging them to continue taking care of Bomani. They were bathing him and walking with him. While still in this state, he tested positive for malaria and they brought him to the hospital. They would take him to worship and try to help him sing or hold his Bible. Then something dawned on me: these eight students had come to our center for medical missionary training. They had sat nine months learning good things about spirituality and health. But only the experience of these past days had taught them the true essence of the gospel in action. Tonight we gathered again to pray and sing in behalf of Bomani and for the first time he opened his mouth–to pray to God. Such a joy filled our hearts! At the end, Solomon, one of the students, went to him to hug him, but he tried to refuse the hug. Solomon persisted, but Bomani, being taller, managed to escape. It was such a funny sight that everyone burst into laughter. And Bomani was laughing, too! 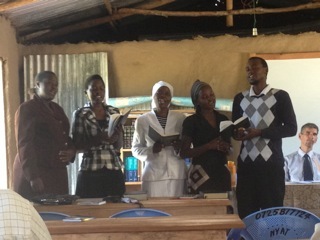 Students at LIGHT school in Kenya. 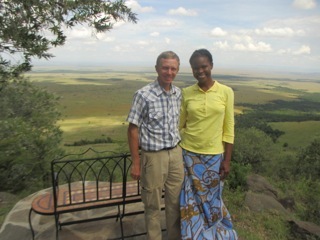 By Elisha and Nadege Vande Voort, who have just completed a three months’ sojourn at the project LIGHT (Lay Institute for Global Health Training) Kenya where Elisha helped in agriculture and Nadege taught Bible and health in school. LIGHT Kenya is devoted to training local Kenyans as medical missionaries and is trying to become self-supporting through agriculture. Email: harvester2188@gmail.com.